In the world of giallo cinema, the name Dario Argento commands some serious respect. A sometimes dazzling cinematic stylist whose best work is characterised by its bravura set-pieces, striking imagery and genre-defining music scores, he hit a serious creative peak in the late 70s with the likes of Deep Red (1975), Suspiria (1977) and Inferno (1980). Suspiria in particular was a stunning triumph of style over content, a threadbare story of witchcraft at a German ballet school whose brain-battering blend of photography, sound, editing, set design and music led to it being evocatively described by one commentator as "the first horror opera." Argento's crown has slipped a bit since then, his work in the late 80s and 90s in particular proving less popular with genre fans and a sometimes unhappy experience for the director – his stylish and intermittently eye-popping 1987 Opera (aka Terror at the Opera) was thought by even Argento himself to be a cursed production, while his brief flirt with filmmaking in America – a segment of Two Evil Eyes (1990) and the 1993 Trauma – did little to restore his once-fearsome reputation. Then in 2001 he returned to the sub-genre in which he had really made his name and horror fans began to sit up and take notice again. Sleepless (Non ho Sonno, more literally 'I am not sleepy') may not quite be up there with the director's earlier giallo greats, it still marked a real return to form for one of the genre's undisputed masters. A short prologue opens at the scene of a recent murder, where kindly and resolute detective Ulisse Moretti comforts young Giacomo, who has just witnessed the slaughter of his mother. Moretti assures the boy that he will find out who did this if it takes him the rest of his life. Ten years later we're in the company of Angela, a prostitute unhappy with the sick games her latest client wants to play, a hard-line attitude that softens a little when a wad of cash is waved in her face. She's spared having to earn it when her client suddenly asks her to leave and lies down for a kip. When he starts muttering about people he has killed she takes the hint and scarpers, in her haste tripping over a cabinet that sends her and the contents of her bag sprawling. Picking up her things and hastily departing, she fails to spot the alarming collection of knives she dislodged in her fall. She's on board a train before she realises she's picked up a folder that's not hers, one that contains the sort of news clippings, photographs and detailed notes that identify its owner as a dangerous serial killer. In no time at all she's running for her life, pursued through the train by the folder's true owner. Familiar generic stuff this may sound, but it's actually a hell of an opening sequence, a shout from the hill that Argento is back in giallo town and how. Classily shot, cut and scored, it moves at a belt and bristles with inventive touches – the image of Angela concealing herself in the connecting corridor between the carriages and the kinetic pan of her on the train as it passes are particularly memorable. And it doesn't let up with her inevitable demise. Unaware of Angela's fate, her friend Amanda boards the train on its arrival to look for her friend and instead finds the incriminating folder. No prizes for guessing who becomes number two on the murderer's new hit list. That the killer appears to be able to spirit himself from location to location with almost supernatural speed and guile is neither here nor there. Concerned that the incident bears more than a passing resemblance to an earlier series of unsolved killings, the investigating police official decides to drop in on the man who was in charge the previous case, and it's none other than Mr. Moretti, who's now retired and forgetful and not much help at all. When a third body is discovered, however, Moretti's interest is rekindled and he starts to recall details that might be pertinent to the new murders. A chance encounter with the now adult Giacomo reminds him of the promise he made to him as a young boy, and the two team up to launch their own investigation into the new killings. This is Argento back on home turf and it shows. The bravura of the extended early pursuit and double murder may not be repeated at similar length, but the the subsequent character and story-driven investigation still intermittently gives way to stylistic attention-grabbers and bursts of grisly violence. As ever with Argento, the two often go hand-in-hand, as with the lengthy but strangely hypnotic track along a patterned corridor carpet that ends in decapitation – that the head is clearly a mechanical effect does the sequence no harm, and if anything prompted in me a surge of Thing-inspired nostalgia for pre-CG prosthetic effects. Considerable technical polish is provided by Ronnie Tayler's rich cinematography and Anna Rosa Napoli's precision editing, while a firm link to Argento's glory days is provided by a typically classy giallo score from regular music masters Goblin. Not everything retained from the director's past films is a blessing. The performances of some of the female victims, the snooty boyfriend of Giacomo's past love Gloria and a spectacularly hammy parking attendant can't help but recall some memorable acting low points in the otherwise fine Tenebrae, and the intermittently wobbly dialogue and delivery suggests an uncertain English dub, but if so it's one that is only occasionally mismatched to the mouth movements of the actors. The leading roles fair better, with two pleasingly unforced turns by Stefano Dionisi and Roberto Zibetti as the adult Giacomo and his friend Lorenzo, but Argento's ace-in-the hole here is the marvellous Max von Sydow, who never slips into a horror movie mindset and plays the ageing Moretti with the same degree of conviction and attention to detail that he would were he in high-profile prestige drama. 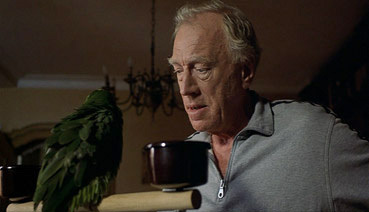 It's a casting coup that really scores when the lone Moretti is attempting to make sense of the case by voicing the details out loud to his indifferent parrot, something von Sydow sells as completely authentic – he's one of very few actors I've watched talk to themselves on screen and make it feel absolutely real rather than performed exposition. Just occasionally there's the sense that Argento is having a little quiet fun with his material – the midgets called in for interrogation, the clap of thunder that dramatically accompanies the discovery of a key clue – and the giallo tradition of misdirecting the audience over the identity of the killer until the final scene is brought close to parody by the two false reveals (one teetering on the brink of fantasy) that precede it. But the journey there is an assured and involving one and littered with the sort of detail and technical flourishes that make Argento the fan favourite he is. Sleepless may not be top drawer Argento – Deep Red or Suspiria it definitely ain't – but it's still a very smartly made and enjoyable modern giallo that sees this most revered of genre directors firmly back in the creative driving seat. A first class anamorphic 1.78:1 transfer from a quality original, with crisp detail, punchy contrast and deep blacks. The colours are vibrant, as you'd expect from a giallo film, but never feel over-saturated – prime colours in particular look terrific. Grain is visible, but only just, and dust spots are very rare. A fine job and the best yet of Arrow's Masters of Giallo series. You can choose between Dolby 2.0 stereo and Dolby 5.1 surround tracks. Both vary a bit in the clarity of the dialogue, with the voices of some characters not having quite the dynamic range of others, but music and sound effects are fine, and both make use of the surrounds on the 5.1, with some effects specifically positioned at the rear. Another of Arrow's specially produced featurettes, this is a lightweight but enjoyable introduction to giallo and Argento, once again built around interviews with director and genre fan Joe Dante and Fangoria editor Anthony Timpone. Some film-specific input provided by makeup effects man Sergio Stivaletti, who talks about his work on the film and gets starry-eyed about working with Max von Sydow. As we all would. An Italian EPK shot during the production and given rock 'n' roll handling and some music video visual ticks. There's still some useful stuff here, particularly the glimpses of Argento at work, the filming of specific scenes and the preparation of special effects, though I would have appreciated lingering on any of these for more than a few seconds. Argento talks about the film, his career, his method of hunting finding the right location and the rules of the genre, while several of the actors discuss their roles and working with the director. In Italian with English subtitles, which translate the word 'giallo' variously as 'mystery', 'thriller' and 'detective story'. All of the scenes in which film dialogue can be heard have the actors speaking in English, but we don't get to hear much and I still suspect some minor roles were dubbed. A neatly cut Italian trailer with all-Italian (dubbed) dialogue, including Mr. von Sydow. 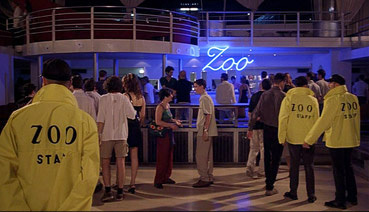 A rolling gallery of screen-sized promo still, cut to the film score. A return to form for one of the genre's true masters, Sleepless delivers the giallo goods with some style, and that opening sequence and von Sydow's presence are almost worth the price of admission alone. As the most recent film in the first wave of Arrow's Masters of Genre strand, it unsurprisingly looks and sounds the best, and though the extras may lack depth and length they are still very welcome. For genre fans, this is a must-have.